Mindika Moments: Monday Moments - Hard Water Headache! Monday Moments - Hard Water Headache! If you have hard water...you know what I'm talking about. I hate hard water! It's so "hard" on everything in my house. From the dishwasher, washing machine, sink, shower, toilet bowls. It leaves it's mark everywhere it goes. But I have found the cure... other than installing a water softener. Lemi Shine is the shine in my cleaning kit. I love this stuff. Have no fear, Lemi Shine to the rescue. It's amazing stain fighting power will remove that film from your dishes, deodorize your garbage disposal, remove film from bathroom shower doors and tile, clean your toilet, and tackle hard lime scale in your tub and on water fixtures. That's why this stuff is a must! 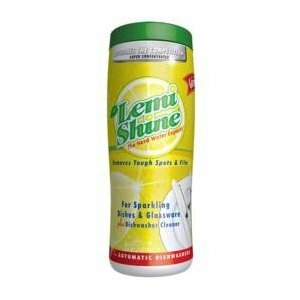 Lemi Shine is an all natural product made from lemon juice, citrus oils, real fruit acids, and fragrance. You can find it at your local Walmart and most grocery stores. It comes in the package pictured below, but it also come in a box with individual pouches for cleaning the washing machine, dishwasher etc. You follow the instructions on the box or bottle (they are different for each application). If you have hard water...run to the store as soon as possible and get this stuff! You will be amazed! *As a side note, I was not compensated in any way for this testimonial. I really do use Lemi Shine and just wanted to share how great this stuff is. If you live in Utah, you can purchase this at any Walmart or Target location. But if you don't live in Utah and want more information on Lemi Shine and/or need to find a distributor near you, click HERE for information. This site also contains detailed instructions for cleaning all the different items around your house. Really? Is this really going to get that hard water off of my shower door? I've tried almost everything and still not much luck!Can't wait to give this a try! Thanks for the tip, my bathroom is sick. Thank you for supporting Lemi Shine, we appreciate it! Where can I buy Lemi Shine? Hope it works. I'm like Cindy, I have tried everything. When I lived in Arizona, Lemi Shine saved me! LOVE IT! I use this ALL the time too! I actually but it in bottles of two because the only store around here I have ever found it in is Wal-mart and then sometimes it is touch and go! This is GREAT stuff! I have looked at our Walmart and can't find it. Will go try another walmart. would be great if it worked and I could find it!!! Katie, I added a link to this post where you can type in your zip code and they'll tell you where you can find it in your area. For instance, I don't think my mom's Walmart carried it either, but she found it at Target. You can also ask your Walmart to carry it. Sometimes stores don't carry an item because they don't think there will be a demand for it, but if people start asking for a particular product they will start carrying it. Good luck!